WD® Music Products, Inc. was founded in 1978 as the world's first source for aftermarket pickguards. 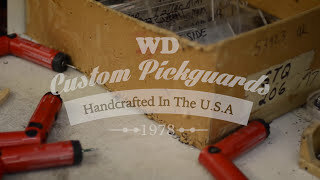 WD® Custom Pickguards continue to be the industry standard over 40 years later. Our standard model pickguards listed here can be modified for any pickup or control configuration. If you do not see your specific model listed here, or would like additional modifications not available online, speak with one of our master craftsman directly via email at custompickguards@wdmusic.com, or via phone at 800.449.9348 ext#112. Please note, our pickguard offices are open Mon-Fri 9-5 EST, all messages received after business hours will be replied to in the order they are received the following business day.